Marinade Chicken and Shrimp. Cut Chicken into Thin few inch slices. Detail and Devein Shrimp. Butter Flavor Cooking Spray Skillet. Add in Meats. Add in 4T RESERVED Marinade. Cook. Once done. Add in drained Black Beans and Pineapple. Cook down. Add to shells of choice with Sour Cream, Tomatoes and/or Salsa, and Onions. ALTERNATIVE: You can amp this with skipping tacos and adding Turkey Kielbasa (Sliced). Serve over Rice (Cooked in Broth). Meatless night, so we used just vegis. You can add Meat, if you wish (*See Notes). Great on Grill or Baked. The Avocado Salsa can be used on ANY Taco! Or, served as a Dip! This was a Great Combo of Flavors. 1c-1.5c canned Black Beans IN LIME W/JALAPENO, drained. I marinaded Vegis for about 4 hours. I used Baja, but, any Mexi Style Marinade works. I even thought about Herb and Garlic. But, have yet to try. Citrus Avocado Salsa: Mix up everything from Orange Juice to Sea Salt. Add in Avocado. Mix. Then, add in rest of Salsa Ingredients. Mix. Cover and place in fridge til use. I decided to cook Sweet Potatoes, separately to keep a separate flavor. Place in Foil. Toss with a LITTLE Oil (I used Avocado. Olive works). Sprinkle nice amount of Oregano on it. I grilled. In separate Foil, I wrapped up Marinated Vegis. I grilled. Serve on Shells/Wraps of Choice with Sweet Red Pepper Hummus, Marinated Vegis, Citrus Avocado Salsa, Sweet Potatoes, and Shredded Cheese. Optional: Roll taco/wrap. Butter Flavor Cooking Spray Skillet. Brown each side. Sprinkle with Garlic Powder. * Notes: Meat? You can choose to Marinade just Meat and cook Vegis on side (With the Sweet Potatoes, Oil, Oregano). Or, Marinade Meat, toss over Vegis in a Butter Sprayed Pan. And, bake… But, it was nice out… So, wanted to find a reason to Grill! Many ways to cook. Whatever works for you. Or, serve Salsa as Dip! Cook meat, adding in Salsa and Taco Pkt. Allow to cool slightly. Mix Taco Meat Mix with Shredded Cheese, to desired taste. Spread Beans on inner side of Soft Shell. Then, spread with A LITTLE Sauce (Recipe below. Optional). Top with Shredded Cheese. Top Tostada with Meat/Cheese Mix, then drizzle on Queso. Add another Tostada. Top with Shredd. Cheese. Spread another Soft Shell (Inner side) with Beans and lil more Sauce (Recipe below. Optional), Lay on top. press edges together. Nicely Butter Flavor Cooking Spray Baking Pan. Place onto Baking Pan. SPRAY tops of Tacos with More Butter Flavor Cooking Spray. Bake 425 til toasty (About 15-20min, or so. I forgot how long! ), keep checking bottoms. Sprinkle with Garlic Powder and Black Pepper. Serve with Drizzle of Taco Sauce, Spoon of Salsa and Sour Cream (Optional). I marinaded and Grilled Chicken (BEST with these! TRY IT! Recipe Below). Butter Flavor Cooking Spray Baking Dish. Add a little cooked/grilled Chicken, Onions, and Mont. Jack Cheese. Roll*. Place SEAM DOWN. Fit all snug. Mole Sauce: In sauce pan, heat Water and Broth cube up. Add in Mole. Simmer til dissolved. Stir in Queso Sauce, simmer a few minutes. I DID NOT USE ALL SAUCE! I did about half, or so. Top over Corn Rolls. Sprinkle top with LIL more Mont. Jack Cheese. Bake in preheated oven at about 400-425 for about 25-30minutes, til bottoms are browning slightly. *I had no problem, so skipped, but, rolling is easier (More flexible), if you place shells, separately, in damp paper towels and microwave few seconds, til more flexible. Marinade Chicken about 4-6 hours, in ziploc bag. Last hour I remove from fridge to bring closer to room temp before cooking. Best on Charcoal Grill. Cook. Shred Up! Marinade Chicken Breasts for about 4-5 hours. Cube Chicken last 30min. and Continue to Marinade. DRAIN excess Marinade. Saute Chicken with Frozen Peppers, minced Jalapeno, and Cumin. Cook til Juices are Cooked Down! In bowl, mix 3T Taco Sauce, 1c Salsa, and 1c Cheese. In separate bowl, mix Creamed Corn Crema Ingredients: Cream Corn, Sour Cream, Parmesan, and Scallions (I allow to set 30minutes). On Softshells, spread a little line of Queso Blanco. Add Cooked Chicken Mix. Add a Spoonful of Creamed Corn Crema. A sprinkle of Shredded Cheese. Roll. Add to Butter Flavor Cooking Sprayed Baking Dish. Top with Salsa Mix. Bake, uncovered, at about 375-400 for about 35 minutes, or til lightly browned and cheese is melted. Optional to Broil at end. Holy Healthy Num-ness! These were AMAZING! Kids begged for more! Add chicken to bag with marinade ingredients, mix, set in fridge about 3-4hrs. After marinading- Seal chicken in foil. Bake 450 for about 35-45min. Cut up chicken and mix with 2tsp of leftover juice from cooking it. Smash/blend cooked beans, set aside. Peel, deseed, and halve oranges, set aside (Try not to demolish in process). Right before building wraps- In separate bowl, mix Cole Slaw Mix. On Lettuce Leaf/Wrap, spread THIN line of beans (Little goes a long way). Top with orange chunks. Top with Chicken. Then Cole Slaw mixture. Wrap. Eat. *NOTES: BEANS are optional! Cook more chicken, if skipping beans. We like it on. Adds to flavor. Great way to sneak fiber to kids. I cook my beans in slow cooker, it’s TASTY. Other OPTIONS: Soft shells or other wrap options are okay. Kids had shells. 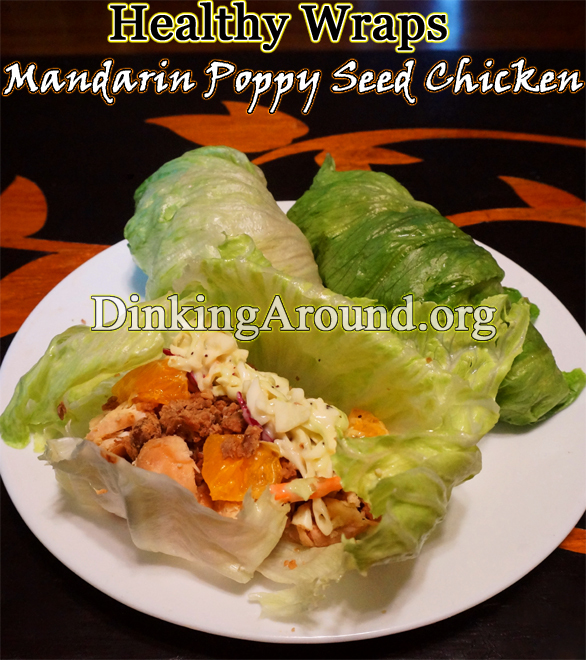 Try a sprinkle of grated Fresh Carrot and minced Fresh Celery on each wrap. We haven’t tried, yet. –As for marinading, in pinch I’ve thrown the marinade ingredients and frozen chicken into a ziploc bag. Left on counter for about 30 minutes. Then added chicken AND juice from bag into foil. Closed foil, baked. Tasted almost the same as marinading… For time cutting. IF YOU’VE NOT TRIED KRAFT CREAMY POPPY SEED… TRY IT! YUM! Simmer, stirring frequently, sauce ingredients in pan til melted. Layer bottom of Butter Flavored Cooking Sprayed baking dish with potato slices (1 layer enough to completely cover bottom) or 1/2 hashbrowns. Top with 1/2 cheese sauce and 1/2 meat mixture. Sprinkle LIGHTLY with a little Shredd. Chedd. Cheese. Top with 1/2 minced spinach. 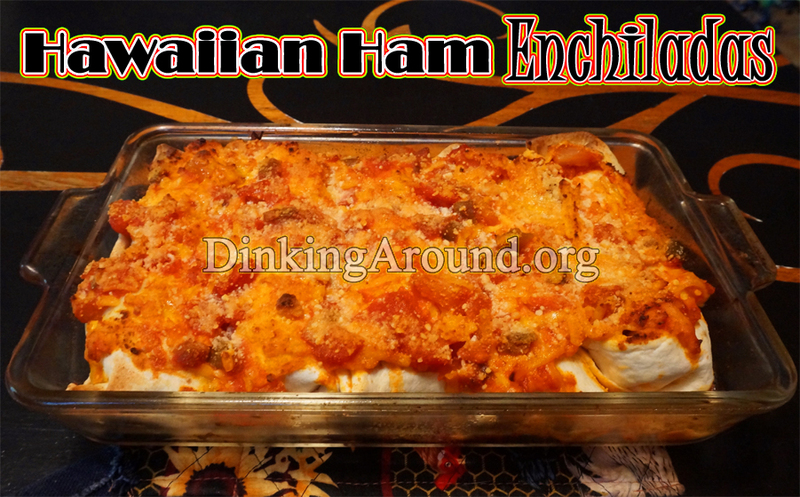 Layer more potatoes (1 layer) or hashbrowns, then rest of sauce and meat. Top top with Light sprinkle of cheese (Optional) and shredded lettuce/Spinach. Bake, covered, 375-400 for 45min- 1hr. Last 15-20minutes I uncover. Topping with Sour Cream is optional. Notes: Beef or Chicken works.